Have you ever taken the time to calculate the lifetime value of an e-mail subscriber? To do so costs you almost nothing, but the knowledge can be of great value to you, particularly when it comes to determining how much to invest in e-mail subscriber acquisition. To explain this, let’s start by comparing the value of postal addresses and e-mail addresses. The cost to rent an individual’s postal address is between four cents and 15 cents; however, to rent the same individual’s e-mail address can cost 10 times that amount. Why the difference? It’s a simple case of supply and demand. The extremely low cost of sending e-mail increases the demand, while the 2003 CAN SPAM Act reduces the supply by making it illegal to acquire e-mail subscriber names in the same way that direct mail names are bought and sold. Certainly, obtaining e-mail subscribers via opt-in registration makes the most business sense, and there are a variety of techniques you can use. But each of these techniques cost money, and in order to know how much to spend on these techniques, you need to know the value of what you’re acquiring. Determining lifetime value is challenging, mainly because it is different for every market and every company. For example, a subscriber’s e-mail address has one value to a retailer, but the same address could have a much higher value to a car rental company. In order to calculate lifetime value, you need to answer several questions. What percentage of your e-mails gets opened? How many result in sales, both online and offline? What is the average order value? What is the cost of delivery and fulfillment on products and services? Armed with these facts, you can develop a table (see Media Player at top-right of article). Imagine this chart represents the calculated lifetime value of an e-mail subscriber for a large car rental company. The profit derived from each subscriber over the course of three years is $265.59. It’s an impressive figure given that 77.8 percent of promotional e-mails are unopened, and is helped greatly by the fact that 64.7 percent of rentals via phone and walk-in are the result of e-mail promotions. I Know Lifetime Value, Now What? 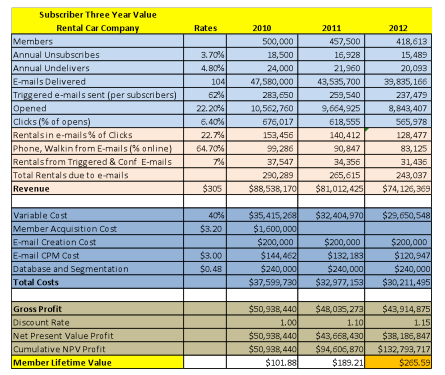 For this car rental company, it’s easy to decide how much to spend on acquisition strategies. At a value of more than $265 per subscriber, the answer is “as much as you want.” But what if your subscriber lifetime value is $40? Or less than $10? Or even as little as 50 cents? Let’s look at some suggestions for improving subscriber acquisition based on lifetime value. For every marketer, there is room for improvement. Evaluate subscriber registration promotions on your Web site. How easy is it for customers to register for your e-mail program online? No matter what your lifetime value is, evaluating online registration is a must because it is the single most cost-effective way to acquire a new subscriber. Yet when put to the test, even the most sophisticated brands are not promoting online registration effectively. Work with your Web team to determine what areas of your site draw the most traffic and start there. But keep in mind, once a visitor determines that your product or service is right for her, registration should be less than a click away. Reward subscribers for signing up. It’s an easy decision to reward new subscribers with a $5 coupon when your lifetime value is more than $265. When your lifetime value is significantly lower, consider less expensive alternatives such as a monthly contest for new subscribers or giving away something of perceived value, such as a whitepaper or product comparison chart. Train employees to collect e-mail addresses. In the store or on the phone, it’s a simple matter of training to get your employees to collect e-mail addresses. Cost can become an issue if you choose to incentivize employees or upgrade your point-of-sale system for e-mail collection. But again, lifetime value can help you determine if these investments make sense based on the profit you stand to make. Use transactional e-mails to entice subscribers. It’s no surprise that the highest open rates in the industry belong to transactional e-mails-order and shipping confirmations, account updates, and so on. In most cases, these are customers who already are interested in your products, but may not be in registered to receive promotional e-mails. Promoting the benefits of e-mail registration not only makes perfect sense in a transactional message, it’s also essentially free. You don’t need lifetime value to make your decision. Invest in an acquisition plan. Many other tactics exist that require a willingness to invest in subscriber acquisition. Some are relatively inexpensive, such as including an invitation to register in your service agreements. Others would require an analysis against lifetime value, such as including a postage-paid registration form in your product packaging. You also can invest in the services of an e-mail appending company that can associate the physical addresses of your customers with e-mail addresses, or locate new e-mail addresses for undeliverable subscribers, and you can invite them to opt in to your e-mail program. Calculating the lifetime value of e-mail subscribers is clearly a vital step in boosting any company’s e-mail marketing program. It costs nothing to do the calculations, but the result could be very helpful in getting your e-mail subscriber acquisition program off the ground.